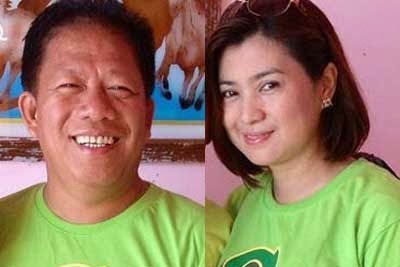 DAET, Camarines Norte – Political speculations here ended yesterday when town Mayor Tito Sarion broke his silence and announced the entry of his wife, Connie, to the forthcoming political derby in 2016. Sarion, who is serving his last term as chief executive of the capital town, admitted to the media that the said decision was reached upon consultation with his political allies. He also confirmed the report that Governor Edgardo “Egay” Tallado, Chair of the Liberal Party in Camarines Norte, was also aware of this announcement. “Gov. Tallado and I were together in the United States last month. We discussed this matter already and he is very supportive of this idea that Connie will be our anointed candidate for the mayoralty race here,” he said. This announcement was made during the induction ceremony of the Daet Society of Arts Enthusiasts officers, which was also attended by political leaders from the Liberal Party. Meanwhile, Sarion said that he will not aspire for any political position in the 2016 election so he can still help his wife and the town. “If she wins, there will be the two of us who working for our town,” he added. He, however, clarified that this is not yet an official declaration, and just a mere announcement from him. It will be the Liberal Party that will make the official announcement of their party candidates, not only for the capital town but also for the different municipalities of the province.